Understanding the natural history of carotid atherosclerosis is essential in the management of patients at risk for stroke. Atherosclerotic plaque at the carotid bifurcation is the underlying cause of the majority of ischemic strokes and the degree of carotid stenosis is strongly associated with stroke risk in symptomatic patients. Pathologic studies comparing symptomatic and asymptomatic carotid plaques have demonstrated that specific plaque characteristics are associated with ischemic brain injury and the mechanisms underlying plaque instability in the carotid circulation are similar to those in the coronary circulation. 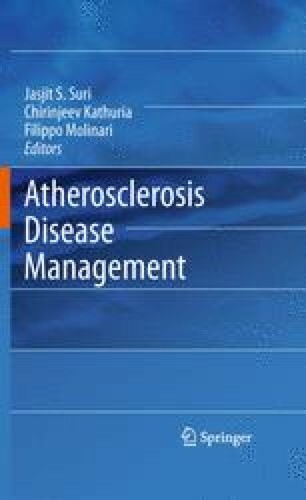 This chapter will focus on the morphologic classification of carotid atherosclerosis based on a modification of the AHA classification system (with a comparison to atherosclerosis in the coronary vasculature) and will consider morphologic differences between carotid plaques in asymptomatic vs. symptomatic patients. In addition, we provide brief overview of the burgeoning number of imaging modalities used in the characterization of carotid plaques, as they compare to histologic studies.